Whether you filed your 2016 tax return by the April 18 deadline or you filed for an extension, you may be overwhelmed by the amount of documentation involved. While you need to hold on to all of your 2016 tax records for now, it’s a great time to take a look at your records for previous tax years to see what you can purge. At minimum, keep tax records for as long as the IRS has the ability to audit your return or assess additional taxes, which generally is three years after you file your return. 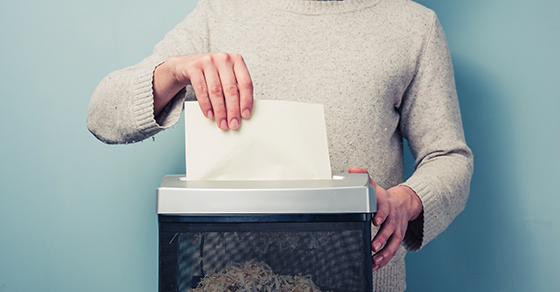 This means you likely can shred and toss — or electronically purge — most records related to tax returns for 2013 and earlier years (2012 and earlier if you filed for an extension for 2013). In some cases, the statute of limitations extends beyond three years. If you understate your adjusted gross income by more than 25%, for example, the limitations period jumps to six years. And there is no statute of limitations if you fail to file a tax return or file a fraudulent one. Tax returns. Keep them forever, so you can prove to the IRS that you actually filed. W-2 forms. Consider holding them until you begin receiving Social Security benefits. Why? In case a question arises regarding your work record or earnings for a particular year. Records related to real estate or investments. Keep these as long as you own the asset, plus three years after you sell it and report the sale on your tax return (or six years if you’re concerned about the six-year statute of limitations). This is only a sampling of retention guidelines for tax-related documents. If you have questions about other documents, please contact us.